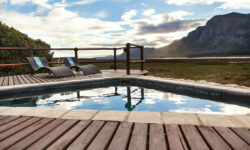 Between the ocean, lagoon and the magnificent mountains you will find Mosaic on the famous Whale Coast of South Africa. 2 hours from Cape Town. Mosaic is a luxury resort is laced with beauty, centrally located for whale watching, marine tours, shark cage diving and exploring the Overberg Wine Regions. 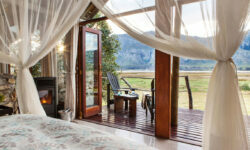 Lagoon Lodge is an all inclusive, 5 star stay, a perfect getaway Lagoon Lodge that captures the essence of tranquility with safari-style suites secluded among the ancient milkwood trees on the Harmanus lagoon. Gorgeous views of the Mountains around you. Mosaic Cottages are lovely stone self catering Mosain Cottages on the Harmanus Lagoon, surrounded by Ancient milkwood trees and fynbos gardens which is perfect for families. Suitable from 2 – 9 guests. While you are here you can try the Lagoon Café at Spookhuis which is built of solid limestone in 1892 and the historic Spookhuis is a legend in the South African history. Abandoned and in state of ruin for 40 years, it was restored by the Johnsons Family in 2008 and is now a home to the café.